[Sweet Apple Acres, Open-PM, Invite, Friends, Family] Apple Bloom's Big Day! OOC- No posting order, but no double posting and please don't hog the spotlight. I demand d'aww creation! Her steps were always pre-naturally bouncy and excitable, almost as if she was a coiled spring constantly trying to outdo herself. The fact was that for some reason most fillies her age were seemingly huge bundles of energy that were so often pent up that release came in the form of neigh-intelligible gibberish and excitedness. But today even the promised normal relief of chores after school and the rigors of recess failed to even slow Apple Bloom down because on this day few things could. Oh, she didn't expect anything big- it was harvest season and the family was simply too busy to take some time off, or so Big Mac had said. Applejack had been absent from the conversation for some strange reason but the result was the same: A sad Apple Bloom who nonetheless was comforted by the warm thoughts of a warm fire, surrounded by family at night under a clear sky. It may not have been the most exciting of all possibilities but it was still a wonderful one. As befit this most glorious of days, the weather was pristine as she hopped down the trails in Sweet Apple Acres heading home. What more could she have asked for than this? It may not have been a shiny gift but a clear, sunny, happy day was almost as wonderful as a toy stable set. The apples leaked off an aroma most alluring and the small animals that roamed the orchard seemed to have smiles hung up on their faces in a nearly artificial manner. Today's happiness and good feelings were spread all around Equestria probably. At the very least anyone within a hundred miles could feel the bundled energy and joy that radiated off of Apple Bloom in an almost visually perceptible manner. That would be a strong aid to her as though the evening and night promised some relaxation and happiness, harvest demanded work and her sister wasn't about to see the crop fail because of one day. She had told Apple Bloom to meet up in the barn after school so they could decide what they were to do that day and while Apple Bloom wasn't a fan of extremely hard work, she also had more fun with her sister on their work days than she had with just about anypony else on any other day at any time anywhere. Plus, it was Apple Bloom's birthday! "SURPRISE! HAPPY BIRTHDAY, APPLE BLOOM!" Pinkie cheered, standing atop her blue cannon. She lost her balance, teetered on the edge of the barrel for a few moments, and fell off into a pile of haystacks. She poked her head out, shaking dust and hay straws out of her mane "You didn't think we'd forget that today was your special, super duper amazing awesome day that you were born, huh?! We've got punch, we've got games! We've got games with punch in them! Also, I perfected my apple fritter cake! I had to deep fry each section at a time cause it wouldn't all fit in an oven! NEAT HUH? Oh! Has anypony seen Gummy? I left him in the punch bowl, but he seems to not be there anymore!" The pink mare looked behind several haystacks, stumbling over a pile of balloons. The inside of the barn was decorated the only way Pinkie Pie possibly could. Colorful streamers and banners hung from every rafter; a flurry of balloons and party favors were literally thrown everywhere. Wooden tables groaned, struggling to hold up all sorts of goodies, all with a country flair. Apple pies, apple cakes, apple doughnuts, even apple fondue and apple cider jelly! A re-purposed water trough was filled with punch and apples. Pinkie pointed to it, grinning. "My latest Pinkie party innovation! Apple punch bobbing and face painting! Very efficient partying, if I do say so myself! You bob for the apple, drink the punch, and the punch paints your face. That's THREE TIMES THE FUN, Applebloom! THREE!" She hugged the little filly "Big birthday huggles for yoooooou! Have fun, okay?! I need to find Gummy before he sets fire to the barn or something..."
Guiding Light was nervous of this day ever since he received the cheerful looking letter that there would be a surprise party for Apple Bloom's birthday. He was used to going to birthday parties before with his other school mates, but this one was... different somehow. Maybe it was because that Apple Bloom had been one of the better friends he knew, willing to see past his shyness and awkwardness to actually take the time to get to know him. Whatever the case, he was nervously waiting for the day. More than the party, Light was trying to figure out what to get his friend. There were several things going against. First, and the most obvious was that he was a colt and the world of a filly was foreign to him. Second was that she was an earth pony and he a unicorn. He didn't really know if there was a difference in gifts, but he assumed so. Also there was the fact of what a gift meant. He wanted to give a gift that she would like that showed that he wanted to be her friend, yet not show that he still saw her as a special somepony, something he knew would end in disaster like it did before. He thought about his options. An apple related gift? Too easy! A red bow for her mane? She probably had several of them in her room! Something farming? Nope. Then he got the advice from his mother, "Why don't you make something?" Of course! He could make a card and something for her to wear, like a necklace. His mother was crafty and helped him acquire these beautiful glass beads that were apple colored: red, yellow and green. After slipping them on a string, he then set to the card. The words poured out of him so easily as he put a quill to paper. Thank you for being my friend. You saw past my shyness and actually wanted to get to know me. Hopefully in the future we can be better friends. In the meantime, I hope you have a great birthday! You deserve to be happy. With his card and a necklace in a box tied together with a ribbon with him, he approached the barn. "Happy birthday, Apple Bloom! I have a present for you." "RUN FER COVER, EVERYPONY!" a frightened Granny Smith shouted as she heard Pinkie's Party Cannon fire. The elderly mare ducked under the table, shaking like a leaf. "We was supposed ta sur-prise Apple Bloom, not everypony at the party!" "You are safe, mein sister!" Uncle Apple Strudel shouted as he pulled Granny Smith out from under the table. "Dat vas dee party cannon of dee pink mare over dere!" "Shootin' that darn doohicky should be agin' the law!" the elderly mare yelled before she got a blank look on her face. "Er, what was I sayin'?" "Vee are here to greet Apple Bloom und vish her a Happy Birthday, ja?" "Well why didn't ya say so in the first place!" Granny Smith neighed as she walked over to Apple Bloom, "Happy Birthday, half pint!" "I sure hope Apple Bloom likes the gift I brung her," Haywire said to herself as she trotted up to the house and knocked on the door. The blonde filly admired her classmate, being the sister of the famous Equestria heroine AppleJack. Haywire liked the way Apple Bloom conducted herself in class. Polite, nice and very 'down to earth,' like she was. She began to wonder what pranks to play on Diamond Tiara and Silver Spoon, if they showed up for the party too. Rarity wore a smile as she watched Pinkie Pie in her element. There was a lot that could and had been said about the peppy pink pony's peculiar personality, but everypony everywhere would agree that there was nopony who could throw a finer party. Her energy and zeal (and her cannon) could put a smile on anypony's face, which was exactly what was called for when it came to the ideal birthday party. Just observing her dear friend artfully launch into surprise mode as Apple Bloom made her entrance brought with it satisfaction. Looking toward the birthday filly, Rarity continued to smile. The kid sister of her dear friend Applejack and best friend of her own darling sister Sweetie Belle, she knew Apple Bloom well and was rather fond of the foal. Sure, she could be a hoofful at times when Rarity was tasked to watch after her, but then again this also might be at least party on account of who she counted as her closest friends. All in all, she generally considered Apple Bloom to be a good influence on Sweetie as well as just an adorable young filly. Rarity stepped forward after Pinkie and a few other guests had spoken. "A very happy birthday to you, Apple Bloom, darling. I do so hope you enjoy this fabulous party our dear friend Pinkie has organized on your behalf!" she chimed in elegantly, offering the brightest of smiles to the birthday foal. Twilight was ecstatic. She had known Apple Bloom for all of about a week, and already she was invited to her birthday! Twilight bounced on her path to Sweet Apple Acres, singing all the way there. "Whee!" She added at the end of her song. She felt as happy as she could possibly be. She had never actually been to a party, seeing as how in Fillydelphia, she didn't have many friends. Or.... any friends, for that matter. But she didn't like to dwell on the past. She continued on her way to the party, her present to Apple Bloom bouncing to the rhythm of her song, which she repeated endlessly, never forgetting to add the "Whee!" at the very end. It was a vital part of the song. Despite it bouncing on her back, Twilight was careful to not break Apple Bloom's present. It was a pink bracelet endowed with apple-shaped beads. The bracelet itself wasn't fragile, per se, but the beads were. And they were vital to the present! And, just in case she didn't like the present, Twilight's mom had also sneaked a few bits in there without Twilight knowing. After travelling for a while, Twilight finally made it to the barn that marked Sweet Apple Acres. ♪ "Hi Apple Bloom!" ♪ Twilight sung cheerily. "Happy birthday!" She added. Twilight set her present down on a table, and went to go converse with other party-goers. The initial surprise of the cannon going off had been enough to set Apple Bloom standing straight up with her eyes bugged out wide, momentary shock doing quite a number of the little filly. She was almost stuck in this position as Pinkie Pie rolled up to her like the ball of sugar that she truly was, pony pelt be darned. It took not long after for Apple Bloom to go from being seized up by fleeting terror to being overjoyed, her eyes sparkling and her heart doing sympathetic leaps in her chest. Why, today wasn't going to be a minor letdown at all, no siree! All that talk about having to somewhat diminish her birthday because there was simply so much work to do was just a cover for this, her birthday party! The sincerest wave of happiness and sheer, unadulterated glee cleansed her of anything not completely and utterly happy. She sprang into the air with euphoria as fuel. "WOW!" She yelled out in the greatest articulation she could muster as Pinkie Pie's words wormed their way through the filly's skull in their evil quest to completely and totally corrupt her to the ways of the party. It called out to everypony, this call to party, and few could resist such luxurious whispers of grandeur being delivered so sweetly. Literally, some times. Pinkie listed off all the games they had and around her the food swirled in a pink whirlwind. It was almost too much for a normal pony to take but Apple Bloom was a Ponyville pony. You got used to it after a while- but then again, she hadn't been alive long enough to get used to it. Everything was amazing, from the way the streams moved in unison yet still managed to create a beautiful arrangement of chaos to accompany the vast array of presents and entertainment. "Thank you, Pinkie Pie! This looks fantastic! Ah'd no idea ya could create a three-ahn-one party device!" She asked, her swirling vision caught up in Pinkie's device for a short while. This whole party was gift enough. Speaking of gifts, her classmates were here and they packed more than bright smiles and growling tummies. There was Guiding Light, who seemed to have come a long way from his days of sitting in the back as quiet as could be. Now he stood in the back of the class as quiet as could be and occasionally said hello to new ponies instead of scurrying away under some nearby brush as fast as his legs would allow. When you were working with a pony as uniquely troubled as Guiding light, you took your victories where you could. Still, she was glad to see that he could be summoned to a party without having to be fought. Then there was Twilight Shine. Nopony would mistake her singing for Sweetie Belle's but it was good enough to get Apple Bloom smiling and if you did that, you were in her good graces. "Hai thar Guidin' Light! Hai thar, Twahlaught Shine! Y'all knew about this all day at school and didn't say a word? Ha! Both of ya are really good at keepin' a secret! I'm so happy you're here!" She said, prancing in place as she she looked at Guiding Light's gift, which wasn't yet in it's proper position! "Ah'll take it over thar, Guidin'," She offered and then immediately delivered, taking the gift and then bounding over there like an excited fox on her way to the sheer mountain of gifts. What wonders were stored within every box? She had no idea but as amazing as they were they failed to compete even partially with the wonders of her friends and family. Just then, Granny's outburst stole her attention. She had gotten used to the outbursts and didn't consider for a second any response other than galloping over with her eyes close and wrapping a big 'ol hug around one of her forelegs. "Granny! This party's amazin'! Ah'd thought today was gonna be all 'bout work and here y'all are! Ah'm jus' so happy!" She said, her back legs stomping at a feverish pace in her glee as she nuzzled her granny's aging pelt as if by the very act of her love she would be transported back to her younger days. Alas, the attention span of a filly is short and a voice of class and cutting distinction bore through despite the relative softness of it Apple Bloom turned swiftly once she pinned it. "Rarity!" Apple Bloom shot out with a mixture of happiness, surprise, and glee. She trotted up to her and cocked an eyebrow with a conspiratorial grin etched on. "Why, Ah betcha were in on this the whole time!" She gave off a second's pause before resuming her joy-fueled up and down bouncing. "Ah'm so happy y'all came! Ah can't believe that Ah couldn't figure this out! Big Mac told me that Ah'd have a lotta chores ta do and then Applejack told me ta come to tha barn after school and here I feel really silly thinkin' everypony was just too dang busy for a filly," Apple Bloom bounced towards the cake, which in true Sugarcube Corner fashion was oversized and packed full of frosting. It was a daunting task to cut, and Apple Bloom knew for certain that any attempt by her was doomed to failure. It'd take a strong pony or a unicorn to handle it and boy howdy, with a barn full'f Apples and a unicorn like Rarity, weren't they in an awful position? "Well, let's get this party started- with cake!" Sweetie Belle stepped out from behind Rarity, a lovely gift wrapped in shiny metallic silver wrapping and a purple bow balanced on her back. "Eeeee! Happy *Birth*day, Apple Bloom!" she squeaked, her voice cracking in her excitement. She trotted up to her friend and reared up to clop front hooves together and bounce happily while letting out excited little giggling squees, very nearly dropping the gift. "Oh, this is an awesome party! *^_^*" She stopped for a moment, going still, her head lifting as she cleared her throat. In more crisp tones, she said, "Thank you very much for inviting me to your party." Having said the polite thing, she went back to squeeing. "I can't wait for you to see what I got you! Start guessing! Start guessing!" She ran along with Apple Bloom to toss the gift onto the table, and then oooooed over the cake, reaching out a hoof to get a lil' frosting on the tip and lick it from her hoof. *^_^* "Mmmmm, that's an especially *good* cake!" she squeeked eagerly! There was something quite infectious about watching the glee of the young foal as her friends and family so lovingly gifted her with warm birthday wishes. The excitement of it all was clear on her face and in the words she spoke to everyone. Rarity just smiled and thought back to her own younger days and the fun surprises they had held. "Rarity! Why, Ah betcha were in on this the whole time!" Rarity just gave a chuckle and a telling smile to young foal. Of course she was in on it. She was a close friend with the party planner herself, and even if that weren't the case, Sweetie's excitement for the party wasn't something she could have ever hoped to escape. Brining a smile to Apple Bloom's face on this special day was definitely something worth making time in her schedule for. Cake was a good place to start. And if it was cake from Sugarcube Corner, it was sure to be a real treat. There were few things Rarity could name that were tastier than the sort of cakes Pinkie Pie the Cakes could concoct. With such cakes, it was hard not to indulge in ways that would prove not so flattering to her figure. She was eager to get a piece, though of course the birthday filly would need to get hers first. "Eeeee! Happy *Birth*day, Apple Bloom! Oh, this is an awesome party! *^_^*"
Just then, Sweetie emerged from behind where Rarity was standing with a squeak. Rarity just laughed. Her sister had been even more excited than usual for her friend's big day, and it showed. "Thank you very much for inviting me to your party." Following the initial burst of excitement, Sweetie came back down for a moment to show politeness and courtesy. Rarity nodded to the filly approvingly. That was very good of her. She felt proud... even though the filly proceeded to then immediately switch back to her usual over eagerness as she presented her present to the other pony and placed it on the table with the others. "Mmmmm, that's an especially *good* cake!" What she did then was not something Rarity could praise. Dipping her hoof in the cake in advance was not polite to all the guests who would be eating it. Rarity walked over toward the filly and the cake. "Now, Sweetie dear, please do contain yourself. I know your excited for your friend's big day, but that's no reason to go wild," she said with a steady nod. "You'll get some cake soon enough," she added wit ha smile toward her darling sister. She looked back toward Pinkie, head tilted. "Why don't you do us the honors of cutting this marvelous cake for us, Pinkie? I'm sure we're all quite eager to try it!" When you have adopted a certain habit over your life, even with the changes you've made others still see you as the pony with that habit. Such could be said for Guiding Light. He, unilke some ponies in a similar situation, knew that he had a problem. For him this problem was his often extreme crippling shyness. He had made great strides to remedy that by trying to talk to other ponies as much as he could. Yet when he looked into the eyes of Apple Bloom, all he could see was that same shy colt she knew from before. But this was her day and not to bring up his problems. Still, if he could some how prove to her that he was not the shy pony she knew, then it would make things even better. Then Guiding Light saw two familiar faces of Rarity and Twilight Shine whom he interacted with, one being a pony who made his suit and the other his special somepony. There was also Pinkie Pie who he had a rather strange encounter at her divination tent. There was also Sweetie Belle who he knew from class. "Oh hi Twilight and Sweetie Belle. How are you doing? And hello Rarity and Pinkie Pie." Light helped himself to a slice of Apple Bloom's cake upon her request. "This is a great apple cake!" Cheerilee felt rather embarrassed about being late to the birthday party - she always stressed punctuality when it came to arriving for class. A birthday party, of course, had no rules when it came to tardiness, but she should always be setting an example for when the ponies of tomorrow were being taught the general skills they would need to be productive, engaged, and well-learned citizens. She was a little surprised she'd been invited, but Apple Bloom and her friends had gone out of their way to make their teacher feel more appreciated; even if the results were very mixed. She knew they honestly cared, which brought a tender smile to her face as she approached the open barn door. It was a very special compliment to have students that loved her so much, even when she had to be strict for them. Cheerilee found a party in full swing as she came in, recognizing so many of the guests: students from her class, older ponies from around town that Cheerilee had seen around, and Abby's immediate relatives - though she blushed at seeing Abby's big brother. In the center of it all was Applebloom, all full of smiles and excitement, Cherrilee waved to her with a big grin, "Hello, Apple Bloom, and Happy Birthday!" "Oh hi Twilight and Sweetie Belle. How are you doing? And hello Rarity and Pinkie Pie." Twilight heard a familiar voice behind her. She turned happily to see Guiding Light, her very own special somepony. "Hey, Guiding!" Twilight said happily. "I'm doing just fine! How are you doing?" Twilight asked, tilting her head. She looked over at the cake, which some ponies had already taken slices of, and decided it must be fine to take some for herself. She carefully grabbed a slice, and took a petite bite out of it. Twilight's face went through many different expressions of happiness and thinking, before her face finally decided on a happy expression. "Mmmm!" Twilight hummed as she took a bigger bite of the cake she was just barely levitating in front of her. She wasn't very skilled in magic yet, but she could levitate small object for a couple moments. "This is really good cake!" Twilight said after swallowing the bite she took. "Who made this?" Twilight said, taking yet another bite. Granny Smith was truly impressed with all of the ponies who were arriving for AppleBloom's birthday party! Fond memories flashed through her elderly mind of her own youthful days out on the prairie before her family was given land to settle on by Princess Celestia. "AppleBloom," the lime green mare began to say, "this is gonna be one hummdinger of a party, kido! I'm so proud of ya!" "Und so am I, Fraulein AppleBloom!" added Uncle Apple Strudel, "Alles Gute zum Geburtstag!" "HAY! Watch yur language thar, little brother! They's ladies and youngin's present!" "I vas vishing her a Happy Birthday in Germane, Granny." "Oh, that's ok then, Strudel." the gray maned mare said as Haywire walked over to AppleBloom. "Y'all have a great farm here, AppleBloom," the rust colored filly said, "and I'm as pleased as punch to be here fer yur birthday! Hope ya like the present I brung ya, how soon do we git to eat?" Apple Bloom had turned away from the unicorn grand marshal of fabulosity when what protruded from behind her but the adorable, squeaky form of her amazing friend and erstwhile ally Sweetie Belle! Apple Bloom should have expected it but with how small Rarity was from the front she was just surprised that a toothpick or a hayseed could hind behind her, let alone a little filly like Sweetie. Apple Bloom reared up in excitement as her friend approached, nearly pouncing back and forth in her devastating excitement. "I was wonderin' where ya were, Sweetie! Ah was 'bout ta look behind this cake, seein' as you could probably hide Big Mac behind't!" She said, initially as a joke but as her mind caught up with the possibilities that lay behind this giant cake, it quickly became apparent that it was anything but impossible. She slowly made her way around the cake, conveniently out of view of Rarity, peeking behind the cake in an effort to spot Big Mac. That turned out to be a waste of time but as she trailed a small line of frosting from her hoof to the other side of the cake on the floor, tiny remnants of it on her lips. Yep, great frosting. "You can say that again, Sweetie Belle an' Guidin'! This here is tha best apple cake Ah've eva seen! Or tasted, for that matter," She giggled as she walked on over to the stack of plates and grabbed one for herself. Plate in hoof, she trotted back to the cake and very slowly cut out a piece. Just then, Twilight asked a question and it was a fairly easy one. "Silly, Sugarcube Corner made tha cake! I sorta wanted Applejack ta make me a cake since she's the best baker in all'f Ponyville, but Ah reckon she was too busy. Not a big deal though- well, I mean, the cake is actually a HUGE deal!" She ended with a laugh, just as the big slice of cake fell onto the plate. She almost felt as if the weight was going to throw her off, but she resettled and cantered over to Rarity with the plate on her back. "Here ya go, Rarity!" Apple Bloom said as she dropped off the cake. She doubted Rarity was gonna eat otherwise, seeing as frosting could probably ruin all of her pretty little hooves and what a disaster that'd be, eh? It was a big piece but the petite mare could stand to add some flab, poor dear looking like a scarecrow, and that was just the simplest of Applejack's thoughts on the matter. It was a good thing she got that taken care of for a moment later, Cheerilee wandered on in finally. You know, for a smart pony like her it sure took her forever to find the largest barn in a thousand bajillion mile radius! It was nice to see her show up, no matter how tardy she was- besides, she could use it as silly ammunition next time Apple Bloom was late. Apple Bloom considered her a role model as well as a teacher, a friend as much as a caretaker for the day. Making sure she was happy, her friends were happy, her family was happy, these were the things she wanted her party to do and by golly they were one step closer to success with her around. Apple Bloom didn't waste a moment as she galloped, partially dirty hoof and all, and lunged towards Cheerilee with an incredibly wide grin. The sugar rush was already in full effect. What was in this frosting? "Miss Cheerilee!" She yelled right before she impacted in a tight hug around the neck, probably ruining her teacher's mane before she let go and fell to the floor cleanly. "Ah'm happy that ya didn't forget how ta find Sweet Apple Acres!" It wasn't intended as an insult to her memory or navigational skills but Apple Bloom wasn't about to give it much thought one way or another as she rushed to the cake, cut a slice, and handed the plate to her teacher on her way to her uncle and Granny Smith. She was surprised they were still up! It was almost five, weren't they supposed to be in bed and snoring louder than a stampede of buffalo by now? "Why thanks for tha wishes, Great Uncle Stru'," Apple Bloom began as she somehow jumped on top of his back to give him a hug around the neck. After a few seconds of backbreaking elderly stallion torture, she transitioned to necksnapping elderly mare torture when she leaped at Granny and hugged her around the neck. "Well, Ah'm so proud of YOU, Granny! 'Cause yer stayin' up so late, hehehehehe," She said with a wink and a smile, enjoying the little jokes her family shared. After she was doing slowly destroying her elders with love and physical action, she turned right into Haywire. Apple Bloom's smile stayed true as she nodded and then suddenly gave Haywire a hug, too. Sugar was an awesome thing! "Why, ya can go on ahead and get yerself a piece'o cake right naw, Hay! And ya should thank mah Granny for how great this here farm is, she practically built it 'erself!" She blasted about an inch from her face as Apple Bloom bouned back towards Sweetie Belle. "So whatcha wanna do first?! Open presents, eat all the cake, play, or go CRUSADING?!" Nursery Rhyme turned around the corner. She galloped her little heart out, and finally, Sweet Apple Acres came in sight. The cream-coloured filly had been looking forward to this for a while, because it was Applebloom's birthday. She had even arranged to move her shift from today to next week, and that was nothing she did lightly. But it wasn't just the cake and punch that called her, no, for once, she had an absolutely kick-flank gift, something that fit the little Apple filly perfectly! The party guests came closer and closer, and little Rhyme came to a screeching halt in front of Applebloom, congratulating the birthday filly obviously being the highest priority. "H-HAPPY BIRTHDAY, APPlEBLOOM!" She squeaked loudly, and then continued a little meeker: "I b-brought you a present." She reached into her small saddlebag and pulled out a box wrapped in pristine, white gift wrap with bright red band with her teeth. A hoofmade card was dangling from one side, which had been covered with little green and red apples, drawn in crayon by the filly. She stood there, breathing heavily through her nose to catch her breath, waiting for anyone to take the present off her, so she could get some cake and have some fun. Are you sure? Make sure only to look at it once you open the gifts, SE. Mark the area below. It's written in white text. In the box awaits you a family sized box of band-aids in different shapes and sizes, in red and yellow, with apples in all colours decorating them. Ingrid Marie still wasn’t quite sure she knew what she was doing. A couple of weeks ago, she received a letter originating from the Sweet Apple Acres orchard inviting her to a young filly’s birthday. The filly, Apple Bloom, seemed to be a distant niece that Ingrid hadn’t even heard of until today. For that matter, Ingrid barely knew who her distant relatives in the Apple family were at all, save for the current family matriarch and the one Apple mare that helped save Equestria a couple of times… Applejack, was it? At any rate, Ingrid hardly ever mingled with her extended family throughout her entire life, and up until the birthday invitation, never received mail from her far-flung relatives. Ms. Marie was tempted at first to simply disregard the invitation to Apple Bloom’s birthday party, but a part of her contained a nagging curiosity about her Apple family. She had been thinking more and more about them recently; perhaps now would be a good opportunity to get in touch with them? Ingrid mulled on going to the birthday party for more than a week, only resolving at the last minute to go. In haste, Ingrid purchased the best birthday gift she could find on short notice; a boxed My Little Princess doll. Looking like a mutant cross between Princess Celestia and Mi Amore Cadenza, it was apparently all the rage among the little fillies of Canterlot who loved to play with her and comb her mane. Ingrid had absolutely no idea if Apple Bloom liked My Little Princess or not, but hey, stuff happens when you buy presents for ponies you don’t know. Giving a glance at her saddlebag containing the wrapped present, Ingrid Marie slowly made her way over to Sweet Apple Acres. She had to ask numerous times for directions, which took longer than necessary because a couple residents couldn’t believe that an unicorn dressed in city-clothes was actually a member of the Apple family. Ingrid briefly halted at the orchard entrance, still nervous whether her trip here was really a good idea. After stopping to take several deep breaths, Ingrid forced a smile and trotted towards where the party was set up. Sweetie Belle sagged a little at Rarity's admonishment, but then rolled her eyes and murmured to Apple Bloom, "I just don't understand what Rarity considers polite, somtimes. Like, tasting the frosting on a cake is uncouth, but at some fancy Canterlot wine party, you're supposed to spit out all the wine. Can you imagine Rarity spitting like that?" She made a quiet little 'hwak-ptu!' noise, then giggled impishly, grinning at her friend. "So!" she said louder, "do you know what kinda games we're gonna play? We gonna do any crusading during the party? Maybe we can get party cutie marks of some sort!" Rainbow Dash floated through the sky, feeling the wind ripple through her feathers and wash over her coat. She carried a package in her teeth, for Apple Bloom's party, but for now she'd forgotten it. The party was *ages* away, anyway... and she could get there in ten seconds flat whenever she wanted! For now, she simply drifted across the sky, enjoying a lazy morning. A thermal touched at her wings and she felt a thrill, and the conditions suddenly brought her to mind of a spectacular trick she had developed a couple months ago. Without hesitating, she launched into it, spiralling through the air and then launching right from the barrel roll into an upward climb. The wind whipped through her mane and she opened her mouth wide in a wonderous grin at the joy of flight. The gift whipped away from her and hurtled towards the ground. "Oh no!" Rainbow gasped, hovering briefly in the air as she came to a stop, then pushed her head forward, and the rest of her followed, streaking downwards through the sky with a small rainbow trail behind her. She narrowed her eyes, pushed herself harder and faster, arrowing down towards the ground, and the little brightly-wrapped speck between her and that great green expanse. She strained, and just a dozen feet above the ground, she snagged a ribbon between her teeth and pulled out of the dive, wobbling across the landscape, just skimming the tops of apple trees, unable to cut her speed as she saw the bright red barn suddenly rearing up before her. Dash crashed in through the open window, clipping her wingtips on the edges and completely ruining any chance she had of recovering her control, tumbling down to collapse heavily on Rarity, the gift bouncing and ricocheting across the room to land in a *whumph* amongst the pile of gifts. Rainbow Dash shook her head and blinked, trying to clear her vision, and looked down to see Rarity looking back up at her from only a few inches away. "Oh!" she exclaimed. "Sorry bout that, Rarity! Had a trick that kinda got away from me there!" She let out a soft laugh at her own clumsiness. "Thanks for bein' there to catch me! Good to know I can count on you!" She glanced around a bit, blinking at all the ponies and bright decorations. "Wait ... what time is it?" Cheerilee gave a great big smile, taken in by little Applebloom's enthusiastic greeting. Sure, the hug may have gotten little cake bits in her now messed up mane, but that was alright; if Cheerilee was used to anything as a teacher of rambunctious, active foals, it was routinely getting at least a little messy. "Hello again, Applebloom." Cheerilee laughed at the idea she'd have trouble finding the farm, anypony in Ponyville knew where Sweet apple Acres was. The iconic red barn was on a hill large enough to be seen by most of town. She was about to say something to that effect when she was practically tossed a followup piece of cake by Applebloom before the little filly disappeared in a streak of hyperactive red and yellow towards the next guest. Cheerilee carried the plate of cake with her mouth to nearby table, then opened her saddlebag to pull out a small, wrapped present. It took her a little while to figure out what to get Abby, thinking something helpful but not too educational and boring. When she remembered all the crusading she and her two close little friends did all the time, the proper gift finally came to her in a flash of insight. After placing the present on the table next to the others, she looked around. She knew every colt and filly in the room of course, all students, and she smiled towards them, but Cheerilee was more interested in chatting with the other adults. She rarely got to do so other than teacher-parent conferences. She picked a cream colored unicorn whom she'd never seen before - perhaps she could avoid work-talk if they didn't have a foal at the school. Cheerilee trotted up to Ingrid Marie and smiled. "Hello there, my name is Cheerilee, are you a friend of the family?" Light watched as Apple Bloom went about from guest to guest introducing herself and welcoming them to her party. Recently there was a mare that Light didn't recognize being from Ponyville. There was also Miss Cheerilee who was busying herself talking with the other older ponies. Light felt a sudden feeling like with his teacher there he now had to be on his best behavior. Not that Light was a problem in school, but the feeling was there. Thw most interesting adult guest was Rainbow Dash who made a strange entrance, bowling over Rarity in the process. Light didn't know much about the Rainbow manned pony other than her name. Perhaps he could meet her later. 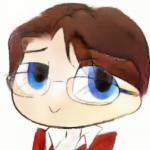 Right now Light felt comfortable sticking with his fellow classmates. "So the cake is from Sugarcube Corner? That's nice Apple Blom. I really like the cupcakes and muffins from there." "I'm doing fine Twilight. I'm just happy to be here for the party. It's been a while since I had one to go to. And of course, I'm happy that you're here and doing fine." "Oh hi Haywire and Nursery Ryme," Light said not wanting to leave out welcoming any classmates as he noticed the two among the group of partygoers. Just then Sweetie Belle asked about games and Crusading. Light was more interested in games. After all, he already had his mark, so Crusading for one would be kind of moot. However if Apple Bloom felt that it was something to do, then he would of course follow her lead. Like all good parties, Apple Bloom's was rather busy. After giving her reprimand to Sweetie Belle, she could hear the filly whispering and giggling to Apple Bloom disrespectfully, but in the crowd she sort of failed to follow what was being said. Instead, she looked around the barn until she focused in on a young colt she had once made a suit for; Guiding Light, she believed. She gave him a smile and a wave and did the same for her good friend and one time school mate, Cheerilee when she noticed she had arrived. She then turned back to see Apple Bloom walking toward her with a plate of cake. She smiled at the filly and took it from her. One of the barn windows was blown in forcefully and a blue and rainbow blur hurtled through the opening. Rarity had no time to react. By the time that she realized this blur of pony was on a clean trajectory right for her, there was nothing to be done. Rainbow Dash collided with her forcefully, the cake smearing all along and into the front of the unicorn mare as she was pinned to the ground. Rarity's mind went blank. There she was, on her back, covered in cake and frosting and looking up into Rainbow Dash's eyes. She had absolutely no idea what to even think of such a situation, especially given some of the more awkward "misunderstandings" in the common history of her and this pegasus. "Oh! Sorry bout that, Rarity! Had a trick that kinda got away from me there! Thanks for bein' there to catch me! Good to know I can count on you!" 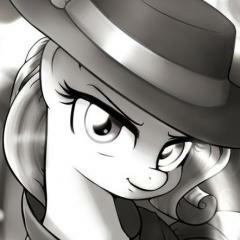 Rarity just stared back up at Rainbow Dash, kind of baffled and at a loss. Eventually she just gave an awkward smile to the other mare and an accompanying laugh. "It's... all right, I suppose..." she said. "You sure do know how to make an entrance, Rainbow," she added, narrowing her eyes a little. Twist slowly walked up the path toward Sweet Apple Acres, a heavily padded gift box balanced on her back. She didn't want the slightest hairline fracture in this intracate peice - it had take almost three days to make. Harlequin running all over the countertops had probably not helped a great deal, he'd knocked over everything that got in his way, including the prototype gift Twist made. It smashed into a million peices when it hit the floor and she had to start again from scratch. The pale filly paused to check her watch. She was really late already! Speeding up a little, Twist continued on her way. Even if Apple Bloom didn't really want to see her, maybe she'd still like a gift from her old friend Twist, wouldn't she? Twist wiggled her nose, shifting her glasses a little further up her face. She was nervous - Apple Bloom barely talked to her now that she had Scootaloo and Sweetie Belle. Twist breifly thought to turn back and go home, but she shook her head. She'd be okay. The present she'd made would be enough for Apple Bloom and her friends to all enjoy. She just hoped she'd gotten it right after only seeing the design a few times. ression became one of sorrow. She was with all her new friends. Regardless, Twist put her gift next to a small pile and walked over to Apple Bloom with a shy gulp. "I'm thorry that I'm tho late, Apple Bloom." Twist lisped. "I left you a prethent over there with the otherth." She looked down at her hooves. "Happy Birthday." 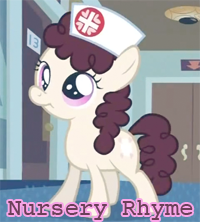 Twist's gift to Apple Bloom is.. 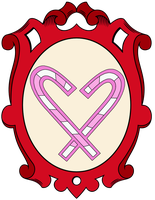 The Cutie Mark Crusaders logo made out of colored clear sugar, flavoured with peppermint! Apple Bloom didn't know a lot about Canterlot wine parties, but she knew a thing or three about spitting and the image of Rarity doing something so decidedly undignified was so unlike her that all Apple Bloom could do was chortle along with her friend. Once Rarity started spitting, it wasn't long before in Apple Bloom's head until she started burping and doing a whole slew of unladylike behavior. [colour=#ff0000]"Nah, Ah reckon Ah can't imagine that!" [/colour]Apple Bloom could hardly contain the rolling log of images in her mind with a fitful stomp of her hooves beneath her. Only with great, deep effort did she regain herself. Thinking of cutie marks related to partying certainly helped keep her on task, which in this case, was partying. [colour=#ff0000]"Party cutie marks would be pretty cool, but Ah'd think that if anypony 'ere was gonna be able ta help us it'd be Pinkie and Ah don'think she's upta tha challenge jus' yet,"[/colour] Apple Bloom said, head on a swivel as she tried to find the perrenial party pony and came up short. She shrugged, [colour=#ff0000]"As for games, Ah'd guess-"[/colour] She began before she was delightfully ambushed by another of her friends. Apple Bloom jumped and spun in place as Nursery Rhyme made her presence known, Apple Bloom caught off guard and surprised in a manner only a sugar rush could provide. After a full second of taking her in, Apple Bloom unleashed a huge hug on the well-known(and thought of) volunteer filly and squeezed. [colour=#ff0000]"Hai thar Nursery! Ah's gettin' a bit afraid that you're just ta busy for a silly filly like me. Thanks for tha gift! "[/colour] Apple Bloom offered as she took it on her back and dropped it off near the rest. It was good timing, too, for not a moment later Rainbow Dash made her dramatic appearance through the open window, a shimmering contrail trailing her as the sound of a dull push of air followed some seconds later. The impact would have done a number on the floor if it hadn't been for Rarity's shockingly durable frame absorbing the hit like she was a hoofball player getting blindsided. Apple Bloom winced and placed her hoof over her face, not wanting to imagine what colour would come about from a mixing of white and every colour in the rainbow with the addition of cyan to match it. She lowered her hoof and found that despite her worst fears, everypony would walk(or fly) away safely. Rainbow Dash appeared to be in good enough spirits and well enough to haphazardly pull herself off of the frosting covered unicorn, a soft laugh escaping her that seemed to Apple Bloom to be sheepish. Confusion too, but whether that was just Rainbow Dash being Rainbow Dash or a sign of something slightly more severe was a matter of some debate. She leaned towards Rainbow being Rainbow, as knowing her long enough allowed for Apple Bloom to attribute any manner of silliness to her. As for Rarity, it took a second for Apple Bloom to realize that the sudden onset of white on white was the frosting but when she did, she felt a little pang of sorrow. If anypony here was bound to lose her cool because of a little mess on her mane, it was Rarity. Yet she seemed to handle it well enough, though the tone in her voice seemed to have gained an edge to it. Luckily, Apple Bloom didn't really notice it. She was just too happy to have yet ANOTHER one of her friends show up to give two hoots and a holler about anything negative. [colour=#ff0000]"Rainbow, it's mah birthday party! Dont'cha tell me that tha crash thar scrambled your brains! "[/colour] She said, ending with a giggle as she pulled the excitable Pegasus towards the cake. [colour=#ff0000]"Come on, thar's a giant cake an' everythin'! Ah got got everypony else thar own slice on 'count of 'em being little fillies or a pony who eats like one,"[/colour] She said just out of range of Rarity, looking at Rainbow, then Rarity, nudging her head in Rarity's direction while winking to clear out the dirt that faintly milled about the pegasus after a crash. Her joke was also pretty funny so she felt no shame in giggling impishly as she then slapped Rainbow Dash along the shoulder. She tuned back to face her when Apple Bloom's eyes ran over another new addition to the party, this one a unicorn with...an apple cutie mark? Her mind did a small loop as she trued to remmeber all of her relations. She drew a blank, which was disconcerting. [colour=#ff0000]"But Ah reckon ya don't need me ta hold yer hoof. Or yer wing, for that matter," [/colour]She voiced nearly above a mumble, almost an afterthought as she moved to meet this new mare. She wasn't about to get cranky on 'er, but present or not she wanted to at least know who the heck was at her party. She approached at a near bounce and took in the unicorn some more. Nope, nothing familiar at all about her. That meant one thing: Time to make a new friend. [colour=#ff0000]"Howdy thar! Whatcher name? Ah'm Apple Bloom and this here's mah birthday party. This here's Granny Smith! She looks all weak and old-like but she's as spry as...something that's really spry! Yer cutie mark's an apple, but Ah'm not re'callin' an Apple pony like yerself," [/colour]She blasted out excitedly, walking around Ingrid and inspecting her like a Griffon might inspect meat. It was during one of these motions that she nearly ran into Twist. Speaking of new friends, here was an old friend who because of their time apart may as well have been strangers to one another. The fact Twist showed up showed she still cared, though the fact she also seemed to stare at the floor told Apple Bloom that the filly needed some cheering up. Who, what, or why she was upset was a mystery but awkwardness and sadness had no place in this place on this night. Apple Bloom hugged Twist warmly and, as was customary, squeezed a little hard before she bounced away. [colour=#ff0000]"Hey there, Twist! Ah'm happy ya came. We got ourselves some apple cake and games an' apple cake and games and even some apple cake! "[/colour] She roared with delight as she cut a piece and swiftly cracked back into the same space, dropping the piece for Twist. [colour=#ff0000]"Anyhoof,"[/colour] Apple Bloom turned around with some confusion evident in her voice, [colour=#ff0000]"Ah dunno what ta do next, really. Ah'd like ta go crusading, but thar's only a few blank flanks and a whole buncha others that would be kinda left out. So....gifts? "[/colour] Her voice edged back up an octave or two by the end as she started trotting towards the gifts. Cheerilee looked surprised for a moment, only saying [colour=#800080]“oh?”[/colour] before she quickly composed herself. It wasn’t that families that had a mix of the three pony types were that uncommon - just that every last Apple seemed to be an earth pony, and there sure were a lot of them. For Cheerilee, to meet an Apple unicorn was one of those wonderfully unexpected delights. [colour=#4b0082]“Oh, I’m sorry!”[/colour] Her shocked face quickly developing into an embarrassed smile, [colour=#800080]“I didn’t mean to be so surprised, but I never knew there were any unicorns in the family! I guess the Apple clan is larger than I thought. My name is Cheerilee, and I have to admit I was surprised to be invited here as really I am just little Applebloom’s teacher at the local grammar school.”[/colour] Cheerilee gave a bright smile as she shook the unicorn’s hoof, [colour=#800080]“so, what do you do, Ingrid Marie?” [/colour]Despite the apple cutie mark, the unicorn didn’t seem the farmer type. Just as expected, Cheerilee showed some astonishment that yes, Apple unicorns were quite real and not a rural legend. Ingrid Marie however was pleasantly surprised how the earth pony took it all in stride, unlike some of the earlier ponies she encountered. Ingrid’s grin grew even wider as Cheerilee revealed she was a schoolteacher. For almost all her professional career, the only educators Ingrid knew as acquaintances or close colleagues all taught magic to unicorns. Encountering a grammar instructor who taught general knowledge to all ponies was a new experience for Counselor Marie.